Terry and I enjoy having pot roast on a Sunday every once in a while, as it brings back pleasant childhood memories for both of us. While we grew up with pot roast in the oven, making pot roast in the pressure cooker is simple and doesn’t heat up the kitchen. Everyone who belongs to Pressure Cooker Recipes on Yahoo! 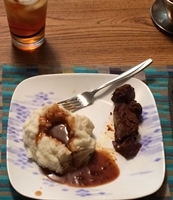 Groups knows about group owner Ray Knapp’s 3 Envelope Pot Roast recipe. It involves 1 packet each of Italian salad dressing mix, ranch salad dressing mix, and brown gravy mix. That combination kicks the sodium level up pretty high, but Ray’s instructions for liquid and timing are spot on. My version follows those instructions. Cut the roast if necessary to fit into the pressure cooker. Rub the roast with the meat rub. Place the rack in the pressure cooker. Add the water and port or red wine. Put the roast in the pressure cooker allowing ample room for the steam to rise. Seal the pressure cooker and set to High for 70 minutes. Use natural pressure release and serve. There are dozens of meat rubs out there, and I use different ones at different times. I especially enjoy Jeff Mauro’s Mega Meat Rub, though I tend to dial back on the salt on this one. You can add potatoes and carrots too! Have done that many times. But I prefer mashed potatoes, even if it is extra work.